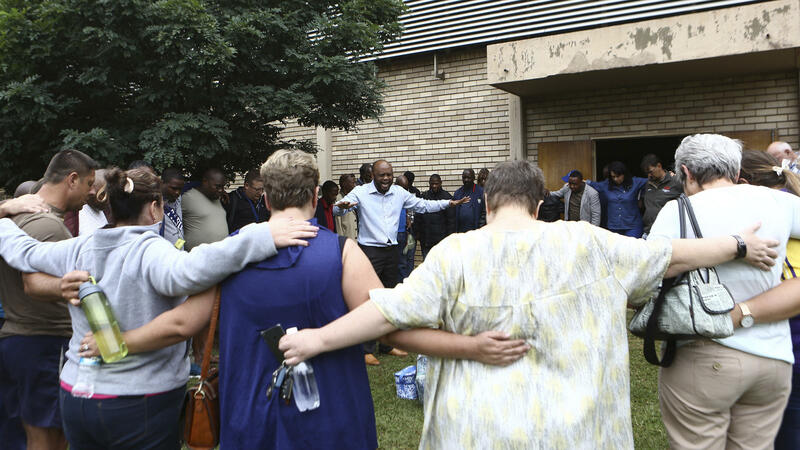 A pastor leads people in prayer Friday at the site of a walkway collapse at the Driehoek high school in Vanderbijlpark, South Africa. At least three students were killed and some two dozen were injured Friday when a walkway collapsed at a high school in South Africa , according to officials. The Hoerskool Driehoek is in Vanderbijlpark, about 45 miles south of Johannesburg in Gauteng province. Panyaza Lesufi, the top Gauteng education official, told eNCA TV news that two boys and a girl died and 23 other students were injured. Lesufi said the government has identified one of the three victims, but no names have been publicly released. "It is painful to see those tiny bodies in that state," Lesufi said, adding that the school would be closed following the incident. A pastor held services Friday at the site of the collapse. Driehoek was inundated with mourners who hugged one another, lit candles and piled bouquets of flowers between the metal slats of the school gates. The cause of the collapse at Driehoek wasn't clear. The state-owned South African Broadcasting Corporation reported that police are investigating. The fallen walkway has been wrapped in yellow crime tape. The broadcaster showed a slab of a white elevated walkway that had fallen just a few feet off the ground and was supported by bricks and red equipment. There was heavy rain the day before, SABC reported, but it was unclear whether that had weakened the structure. 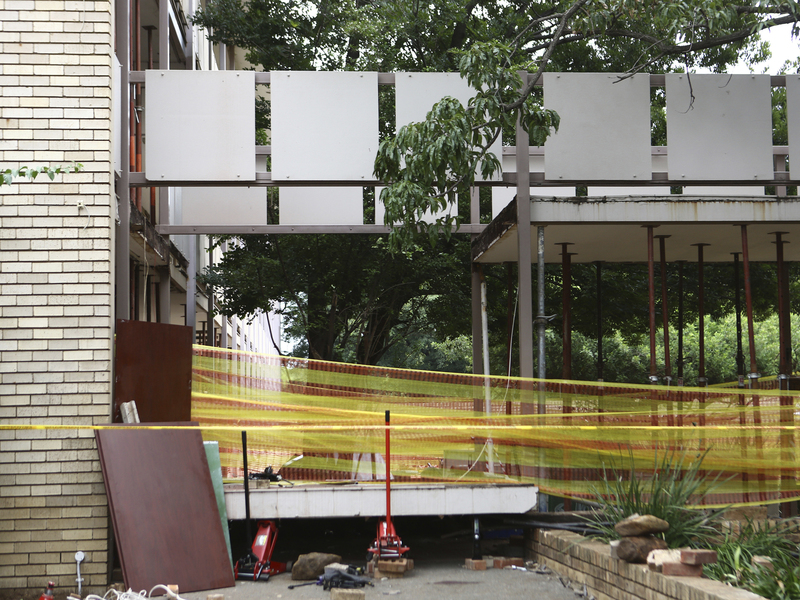 Police tape cordons off the site of a walkway collapse at the Driehoek High School in Vanderbijlpark, South Africa, Friday. Buang Jones, a representative from the South African Human Rights Commission, visited the school and said the incident raised questions about potential human rights violations. He said he is asking the Department of Education to conduct an investigation of all education facilities in the province. "They have a constitutional obligation to protect children's rights and to ensure that education is accessible and the learning environment is conducive to all learners," Jones told SABC. Schools in South Africa are plagued with inadequate facilities. NPR reported on a 5-year-old student who died in 2014 after he fell into his school's pit toilet and drowned. During a recent drought, school administrators turned off taps at schools around Cape Town, and instead told students to bring their own drinking water.